In addition to our ongoing programming, we routinely take on a variety of “Special Projects,” which are time limited. We also occasionally act as fiscal sponsor for projects aligned with our mission that do not have nonprofit status. We currently serve as fiscal sponsor for Latin Dance Grooves Carnaval Contingent. In 2016, a group of cultural arts organizations within San Francisco’s Latino Cultural District came together to create Paseo Artistico, a neighborhood arts project dedicated to bringing free cultural arts activities to the corridor every second Sunday of the month. The monthly art stroll offers neighborhood residents and tourists alike the opportunity to experience the cultural vitality of Calle 24’s Latino community. Activities—which may include anything from live music to poetry readings to film screenings to artist workshops—are staggered in such a way so that pedestrians can spend the afternoon leisurely walking from one venue to the next. Acción Latina, which secured funds from GFTA’s Neighborhood Arts Collaborative in support of the project, acts as the lead organization for Paseo Artistico, with partnering organizations being: Modern Times Bookstore, Alley Cat Books, Precita Eyes Muralists, Adobe Books, Luna’s Press, and Cine+Mas SF. Participating merchants, all of whom offer discounts or giveaways during the Paseo Artístico events, include: Dagwood and Scoops, Praxis, Luz de Luna, Tio Chilo’s Restuarant, Temo’s Coffee, Humphry Slocombe, L’s Caffe, and Mixcoatl. In 2015 Acción Latina was one of 203 organizations from across the nation selected to receive a grant to hold public programing about the history of Latinos in the United States. 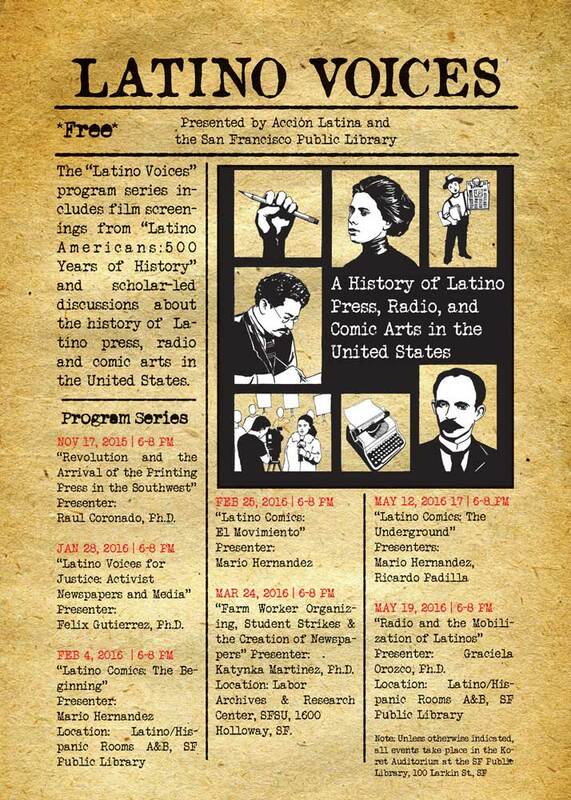 Our project is titled Latino Voices: A History of Latino Press, Radio and Comics in the United States. Programming includes six episode screenings and scholar-led discussions supported by relevant photos, books, audiovisual materials, and ephemera. 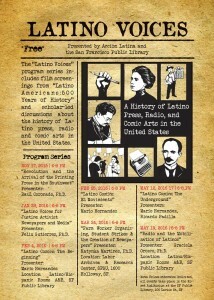 Key themes will focus on the rich Latino history of print culture and public reading; how Latinos used poetry and music to relay news in the United States; the relationship between newspapers and Latino social movements; and the importance of advocacy journalism and Latino media in an era of media consolidation; and the history of Latino comics. We have served as proud fiscal sponsor of the Latin Dance Grooves. Founded by Elizabeth Soberanes in 2008, Latin Dance Grooves is dedicated to exploring, performing and promoting the art of Latin Dance, which it does through offering dance classes, hosting dance performances and producing an award-winning Carnaval Contingent as part of Carnaval San Francisco’s annual Grand Parade. Since 1985, we’v have produced Fuerza Joven, a summer journalism training program for Mission District youth. Fuerza Joven has helped to engage youth in their communities through real-life, meaningful journalistic projects that foster empowerment, creativity and exploration of place and cultural identity. In 2007 we launched a national campaign to acknowledge and honor the 200-year history of Latino journalism in the United States, beginning with New Orleans’ El Misisipi newspaper in 1808. El Misisipi set the stage for the thousands of publications, broadcasts and Internet news outlets currently serving Latinos. Our own El Tecolote newspaper is a part of this legacy of journalism, serving the Spanish-speaking and bilingual communities of the San Francisco Bay Area. Yet, the story of Latino journalism—and the countless innovative publishing pioneers and courageous journalists—is little known. Our multimedia project, called Voices for Justice: The Enduring Legacy of the Latino Press in the U.S., currently features a 17-minute documentary and will eventually include other components such as an interactive website with resources and teacher guides.